Hello, and apologies for my lack of update these past couple of weeks. 2 weeks ago I lost a very close member of my family and it has been a difficult time for us all. Therefore, there have been things I had wanted to write and update about but did not feel I was quite able to. I would like to though try to cover here some of the many issues going on around the Ward and also in Fife that I have been involved with. Things it seems have not been resolved in regards to the, at times, very poor service on offer from ScotRail. I received another email this morning from a resident about one of the morning Fife Circle trains failing to stop in Inverkeithing and again, only having two carriages. A litany of "reasons" (I would call them, poor excuses) have been provided by ScotRail ranging from insufficient train crew to bad weather. I also note that there has appears to be little that the Transport Minister is saying to provide reassurance and assurances to commuters on this busy route that he is addressing it and that a speedy resolution will be sought. I spoke to a resident at the beginning of January who told me that his daughter was returning to Burntisland on the train on the Friday evening before Christmas. At Inverkeithing everyone was told to leave the train as it would not be stopping in Aberdour, Burntisland, Kinghorn or Kirkcaldy. Whilst some passengers are able to quickly call home and request a lift or pick up a taxi, not everyone can do this and I am particularly concerned for any vulnerable passengers who may have been affected by such a decision. Quite simply the situation is not good enough and I am continuing to push for answers. Please watch this space as I am likely to have something further to add. Meantime, do continue to contact me if you have any stories of ScotRail failures on the Fife Circle. Passengers deserve a much better service than they are currently receiving. Thank you to the Fife Free Press for running this story and for giving me the lead comments here. 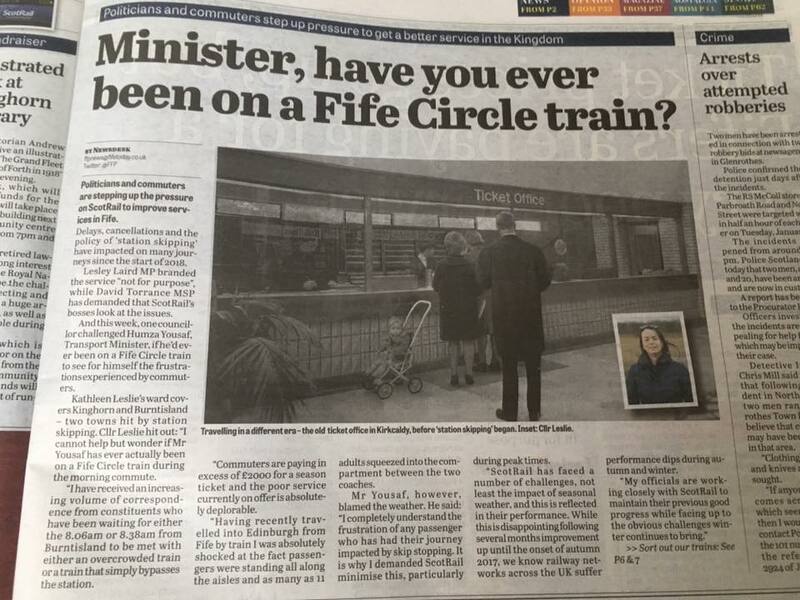 "I cannot help but wonder if Mr Yousaf has ever actually been on a Fife Circle train during the morning commute. Over the past number of weeks, I have received an increasing volume of correspondence from constituents who have been waiting for either the 08:06 or 08:38 from Burntisland to be met with either an overcrowded train or a train that simply bypasses the station. Commuters are paying in excess of £2000 for a season ticket and the poor service currently on offer is absolutely deplorable. Placates from the Transport Minister about a new timetable with 3-coach class trains being introduced in 2019 is of little comfort to those who are waiting on a train to take them to work in the morning. Having recently travelled into Edinburgh from Fife by train I was absolutely shocked at the fact passengers were standing all along the aisles and as many as 11 adults squeezed into the compartment between the two coaches. It does not bear thinking about what would happen if there was an incident. I would urge Mr Yousaf to be asking some tough questions of ScotRail as to why trains are routinely being cancelled and why there are so few coaches at peak hours. I will be writing to the Scottish Government seeking assurances that the concerns being faced by train users in Fife are being properly addressed. Passengers deserve a far better service." In my last post I once again highlighted the urgent need to address the building of replacement high schools in Dunfermline and West Fife. I also published a letter stating that whilst this was in Dunfermline it is a Fife wide issue. Yes, we need more houses to be built but that has to include sufficient infrastructure to be in place. Back in December I pushed for this with a motion to Full Council. Despite my call for quarterly reports to come back to Council, the Administration instead voted for an amendment which said reports would go back to the Education and Children's Services Committee - although no dates or timescales were attached. I can report back here that at the Education & Children's Services Committee, which was held this week, there was so far no Agenda item and no report. The Committee sat on Tuesday and had a busy agenda. The ongoing catchment and capacity issue in Dunfermline will be addressed fully at Committee in March, when a new set of options should be available and a recommended timeframe. At this week's committee there was only a short agenda item on catchment which has stated that a resilience plan will be getting rolled out over the next number of weeks and pupils will start this after the Easter period. 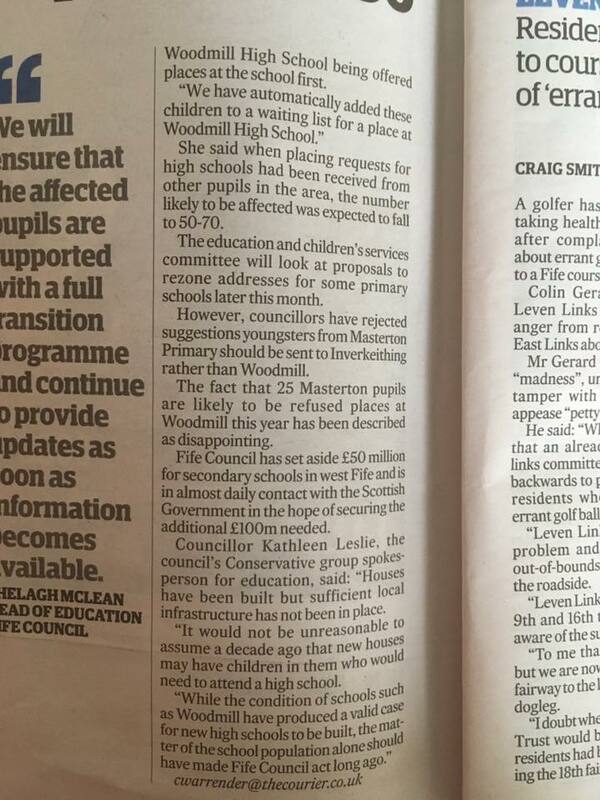 My main concern, and one which I stated to Committee, is that currently there are 95 pupils who potentially do not have a place at Woodmill. 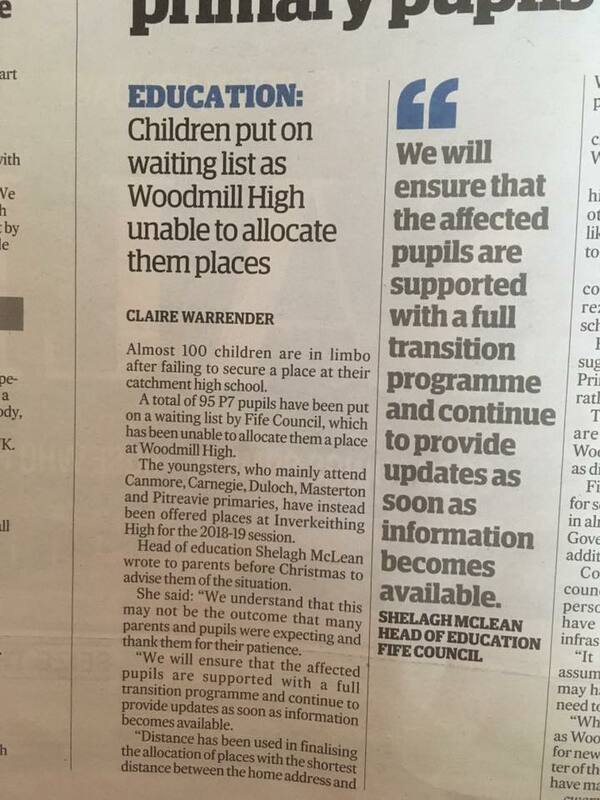 Those 95 pupils have been allocated a place at Inverkeithing High School, however they may also have put in a placement request (which can be done until 15th March) and they may also (dependent on where they are on the list) be allocated a place at a later date at Woodmill. Therefore, they are potentially linked to three high schools they may or may not be attending. I was less than satisfied at the response I was given that everything possible is being done. That may well be but it still leaves youngsters, at an important stage in their educational development, in limbo about where they are going to school in August. 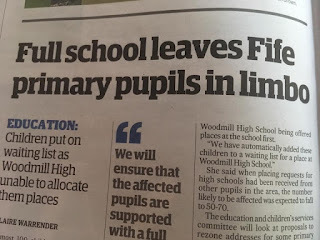 Even more shocking was to discover that from Limekilns, which only has 12 primary 7 pupils, 5 have not been allocated a place at Woodmill whilst the other 7 have. I struggle to see how that is fair, right or in their best interests. The handling of this by the Directorate has been less than satisfactory and is causing continued worry, stress and uncertainty for many parents and their children. Additionally, this also means that once this year's affected primary seven pupils move into S1, next year's cohort from each primary school will not be following the same as this year's as no doubt there will be more changes once rezoning goes ahead. I have previously stated that poor planning and lack of foresight by the previous Fife Council Administration is what has created this and I stand-by those comments. What is even worse is that the previous Administration made a huge amount of noise blaming the Scottish Government for not producing more money for new schools. Yet that same Labour group in this new coalition they are a part of, were unwilling to support my Motion asking for regular reports to return to Full Council and appear to have been stymied in their criticism of the Scottish Government for not addressing this urgently. 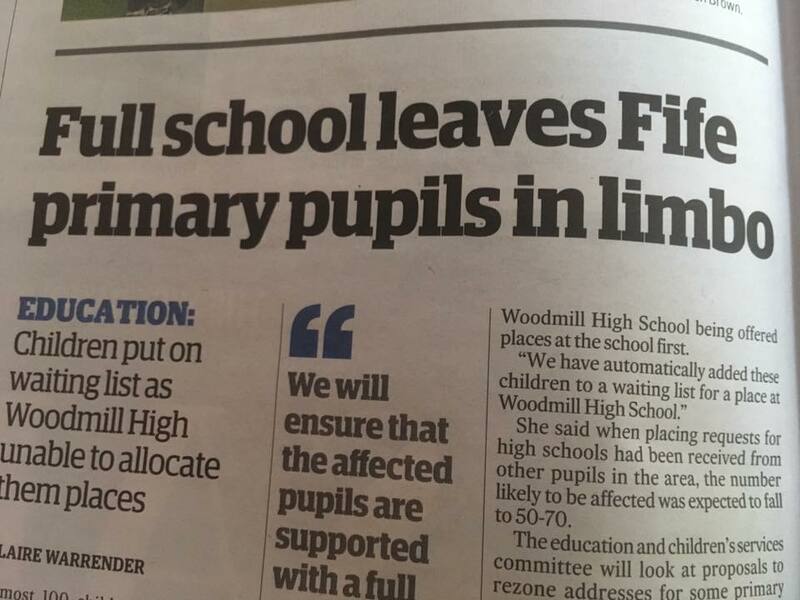 Committee also addressed school inspection in Fife, of which there was only one carried out in a secondary school last session. Given that Fife has 18 secondary schools this demonstrates quite a poor performance on the part of Education Scotland. However, we have been assured that there will be an increase in school inspections this session and that support will be in place from the Education & Children's Services Directorate for schools following inspection. Currently Fife does have robust systems in place for this, as it does in tracking attainment, concerns around proposed changes to educational governance was a stand alone item but ties in well with the overall picture of the direction of travel in relation to attainment and performance. Fife, under proposed changes to education governance, is to be part of the South East Scotland Regional Improvement Collaborative - along with Edinburgh, East Lothian, Midlothian and The Borders. Major concerns within the Conservative group are down to accountability - which is the key word in all of this. Currently much of the accountability for education and performance lies with the individual local authority. The Empowering Schools paper though (which runs in conjunction with the consultation - see below link) states that the "local authority will participate". Such is our concern an amendment was tabled at Committee by our group specifically addressing the transfer of powers to the Regional Improvement Collaborative. Simply put; as a local authority Fife's priorities may not be exactly the same as Edinburgh or Midlothian and what happens here in Fife is best placed, in working with local officers and councillors, for Fife. The Committee also provided detail on a new strategy for supported learning. The item outlined current provision for supported learning for those with additional support needs (ASN) and how this is addressed in Fife. Coming from a background in teaching youngsters with ASN I have particular interest in the approach the directorate intends to take on this. 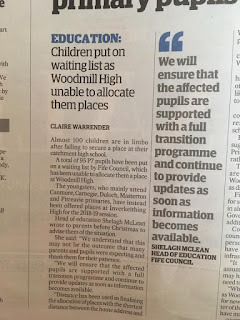 At the moment there are five secondary schools in Fife with a dedicated Department for Additional Support (DAS), this of course means that some of these pupils have to travel out of what should have been their catchment school. This also means that according to the Standard in Scotland Schools Act which states: "the right of all children and young persons to be educated alongside their peers in mainstream schools", does not always happen. However, that should not be taken as a negative per se. The DAS that exist in secondary schools in Fife have a dedicated staff of teachers and support assistants and, as officers noted in their paper, there is an "expertise" amongst these staff. My concern arises from the fact that the needs of pupils in the DAS are quite different to pupils with shorter term support needs, such as English as a second language or due to long term absence from education. At this point I am going to be writing to the directorate to ask for further clarification on how this is intended to be rolled out as I did not feel that in the space of the Committee meeting a full answer was provided and I also have further questions I would like to ask. Once I have feedback from my further questions I will provide an update here. It is my view that any change in provision for youngsters with life-long additional support needs has to be a very carefully considered (with real consultation with staff and parents and carers) before any definite changes to educational provision can be put in place. Teacher shortages, a need for increased CPD opportunities and consideration of implementation and impact on health and well-being of all youngsters must be priorities before such changes. I am concerned that to some extent this is a financially motivated change, I do not want though to be cynical, which is why I intend to ask further questions. Today (Wednesday) has been somewhat quieter. 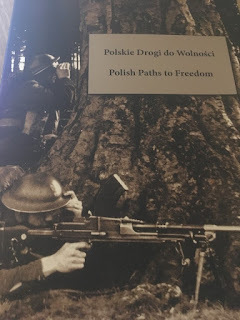 This morning I was honoured to be invited to attend the Polish Paths To Freedom event in the Rothes Hall which was dedicated to the Polish soldiers who served in Fife and Scotland in the Second World War. 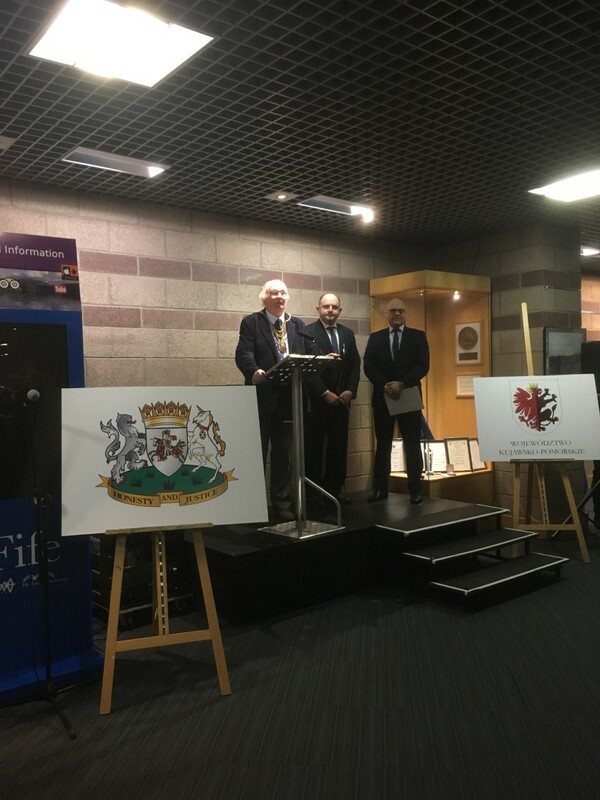 The event was attended led by Fife Provost, Jim Leishman and the Marshal of the Kuyavian and Pomeranian Region of Poland, Mr Piotr Całbecki. Having written by undergraduate dissertation at university on the Polish Government In Exile I was especially keen to attend today. As Mr Całbecki reminded us, war is never a good outcome. The photographic exhibition is on display now at the Rothes Halls. Last week I met with a representative of Floral Action Burntisland (FAB) to discuss maintenance of the plants and trees around the primary school. Whilst the concept of developing habitats for wildlife and bringing nature to the school is wonderful, the upkeep and maintenance is another matter. I was saddened to see what has started off as a very beautiful concept of trees, shrubs and flowering plants on the perimeter of the school grounds, has become overgrown and unmanageable for any small group of volunteers. A proper clean up and weeding of the area is required. At this point myself and one of my ward councillor colleague's are trying to establish ownership of parts of the land and how to determine the best solution. 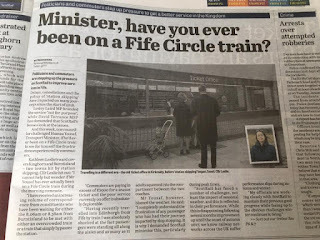 As mentioned earlier in this post, the Fife Circle continues to create a myriad of problems and stress for morning commuters. This has been brought to the attention of representatives at Holyrood and I will update as and when I have further information. Due to family matters which I mentioned at the beginning of this blog I have not been attending as many meetings in the Ward this past 2 weeks, therefore, if there is anything you would like to discuss please do get in contact and I will call or email you and arrange a suitable time to meet.